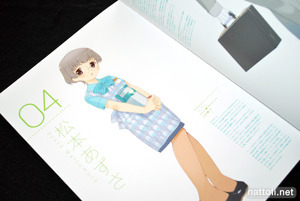 Mibu Natsuki's art book Tetsudou Musume Illustrations is another of the many art books that came out during the end of March, beginning of April period. 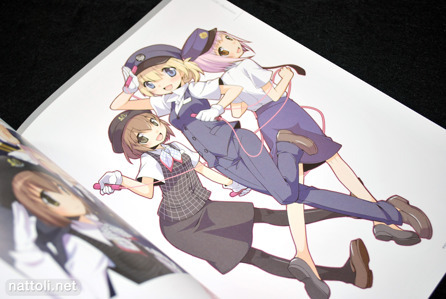 Tetsudou Musume Illustrations is a softcover A4-sized, 128 page collection of Japan's railway girls in uniform that has spawned a TV drama, manga, video games and figurines. 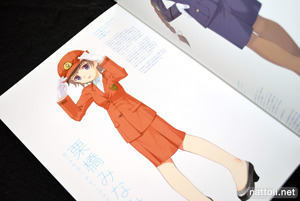 One of the cool things to consider while looking through this art book is that these uniforms aren't imagined up by Mibu Natsuki; they're all very real and based off of uniforms worn throughout the train stations in Japan. 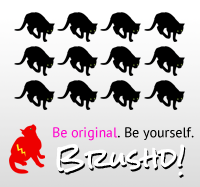 This pretty much also accounts for the fact that some of the outfits worn aren't terribly interesting, but then again every day work clothing seldom is. 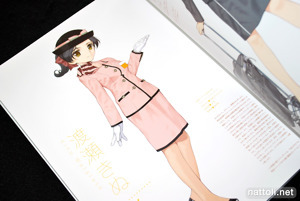 All of the railway girls have had a figure made after them, but they're the small kind of gashapon figures that retailed originally for around ￥525 to ￥630. 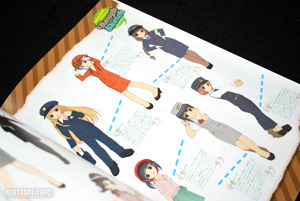 In each section of the book, after the character illustrations are shown there is a photograph of all the girls as figures. 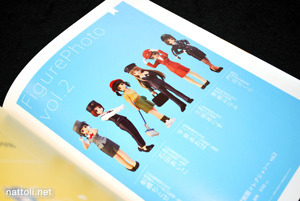 There have been in total 9 series of six Tetsudou Musume figures each, making there a total of 54 solo character illustrations (one per figure) in the art book. 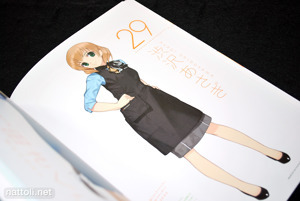 Though the character profile illustrations make up the majority of Mibu Natsuki Illustrations Tetsudou Musume, towards the back is an other works section which not only includes more finished illustrations by Mibu Natsuki, but other artists who also drew for Tetsudou Musume. 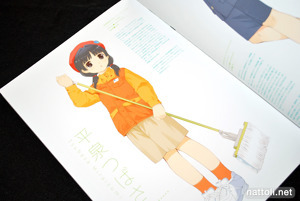 It might surprise you to know that the illustrations above are not by Mibu Natsuki. 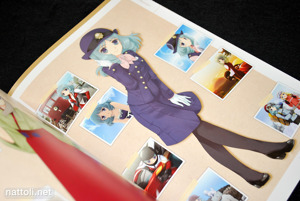 They're by Sion, the artist commissioned to illustrate for the Tetsudou Musume Nintendo DS game. 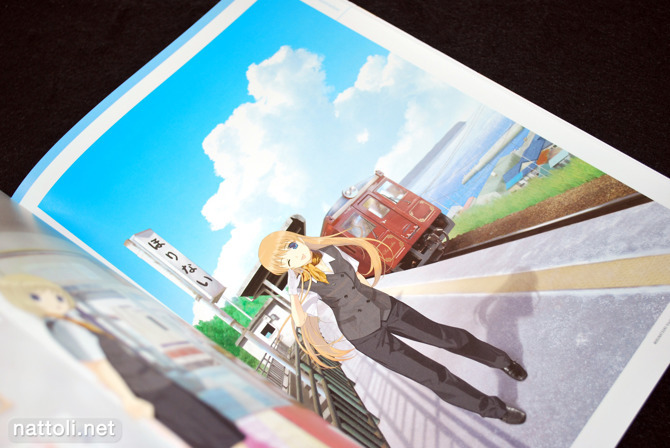 Sora Kitahara's illustrations for the Tetsudou Musume Song Collection covers are also included. 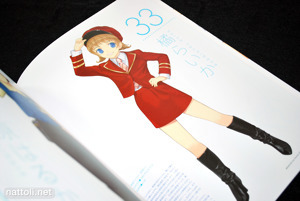 Even Matsuda98---who is the artist for the Tetsudou Musume manga---had illustrations included, though it was only two pages. 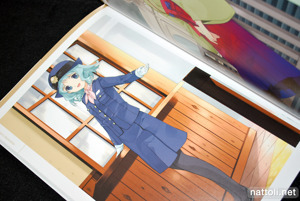 But there is also a short manga comic at the back that I believe is exclusive to the art book. 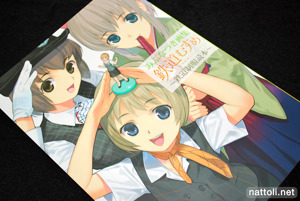 Yowza, sorta expensive but I guess it has a lot of good pages, right? 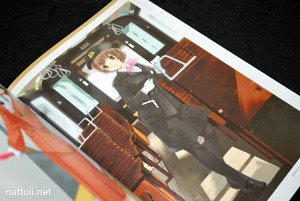 It's good, but actually ￥2940 is a pretty average price for an art book. 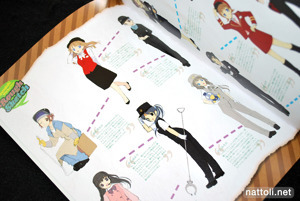 Anything within the ￥2500 - ￥3500 is standard from my shopping experience. 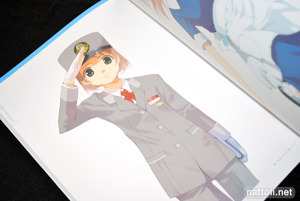 Looks like a terrific book filled with cute girls in uniform (this appeals to every man's uniform fetish).